Split seconds before 5:30 a.m. on Saturday, December 16, an American soldier from Company K, 110th Infantry, manning an observation post atop a concrete water tower along the Skyline Drive in the village of Hosingen, telephoned his company commander. In the distance on the German side of the Our, he could see a strange phenomenon: countless flickering pinpricks of light. Moments later both he and his company commander had the explanation. At Hosingen, along the rest of the Skyline Drive, and at many another point along what had become the quiet front in the Ardennes, the morning darkness suddenly came alive with a maelstrom of bursting shells. To start there, however, would be to tell the middle of the story before the beginning, and I don’t truck with clever literary devices like that. The genesis of Unternehmen Wacht am Rhein came in autumn of 1944, shortly after British forces liberated Antwerp and during Montgomery’s ill-fated airborne attack on Arnhem. In keeping with plans that received Hitler’s personal support, it was bold to the point of delusion. Some twenty-five divisions would be pulled from quiet sectors of the western front, the quieter sectors of the eastern front, and OKW’s (that’s Oberkommando der Wehrmacht, the Supreme Command of the Armed Forces, for the uninitiated) strategic reserve, and would drive from the Siegfried Line between the town of Diekirch along the Our River in the south and Malmédy and Monschau in the north. The Panzers were to penetrate deep into the Ardennes through the Losheim Gap at the west foot of the Schnee Eifel, wheeling northwest once they reached the Meuse and covering the remaining forty miles to Antwerp. In doing so, they would drive a wedge between the British sector northeast of Antwerp and the American sector to the southwest, and Hitler hoped that the isolation and elimination of several corps’ worth of British troops and American disillusionment over a major defeat would lead to a separate peace. His misunderstanding of politics on the Allied home fronts aside, the generals at OKW and those placed in charge of the operation uniformly thought that Antwerp was an unrealistic goal. In no small part, they formed this opinion on the basis that the Ardennes is not what one would refer to as good tank country. All Hitler wants me to do is cross a river, capture Brussels, and then go on and take Antwerp! And all this in the worst time of the year through the Ardennes where the snow is waist deep and there isn’t room to deploy four tanks abreast let alone armored divisions! Where it doesn’t get light until eight and it’s dark again at four and with re-formed divisions made up chiefly of kids and old men—and at Christmas! The Ardennes had featured prominently in two previous 20th-century battles: a dustup between the French and the Germans in the First World War, during which the counterattacking French were badly beaten and ended up losing territory, and the ‘battle’ during the Fall of France in 1940. The latter wasn’t so much a battle, though, as a drive through the Ardennes: the French and Belgian forces defending the region didn’t expect to see so many tanks, and were quickly driven back by the German forces, who promptly got bogged down on the terrible roads characteristic of the Ardennes, and were only saved from destruction from the air by the overwhelming superiority of the Luftwaffe. Speaking of things characteristic of the Ardennes, I think I should be more detailed. It’s a labyrinth of deep valleys, through which run fast-moving, steep-banked rivers almost impossible for vehicles to ford, separated by forested hills, connected by generally poor roads. Nearly anywhere there was a bridge, there was also a town which could be fortified. There were really only three points that made the Ardennes suitable at all. The first was that the American forces in the vicinity had just taken part in a knock-down drag-out brawl in the Hürtgenwald on the way to capturing Aachen. The defending forces were overstretched all through the Ardennes, and generally either inexperienced or receiving replacements. The second was the weather. (The plan for the predawn assault on the 16th included searchlights bounced off the clouds to simulate moonlight. “How do you know you will have clouds?” asked Hitler. Responded von Manteuffel: “You have already decided there will be bad weather.”) In December in the Ardennes, clouds, fog, and snow are the rule, and their presence certainly kept the offensive free from aerial attack for the first week. Third, but probably most responsible for the initial successes, was the utter failure of Allied intelligence services to realize what was coming. Forward, march, march! In remembrance of our dead comrades, and therefore on their order, and in remembrance of the tradition of our proud Wehrmacht! We will not disappoint the Führer and the Fatherland, who created the sword of retribution. Forward in the spirit of Leuthen! Soldiers of the West Front! Your great hour has arrived. Large attacking armies have been started against the Anglo-Americans. I do not have to tell you anything more than that. You feel it yourself. WE GAMBLE EVERYTHING! You carry with you the holy obligation to give everything to achieve things beyond human possibilities for our Fatherland and our Führer! Noted the intelligence officer of the VIII Corps, “These documents indicate the scope of the German offensive, and its importance becomes apparent from the impressive list of high-ranking German generals whose signatures appear thereon.” I should say so. Those messages went out to the whole of the German force lined up opposite the Americans in the Ardennes: in the northern sector of the front, opposite Monschau, Elsenborn, and Malmédy, the Sixth Panzer Army, four SS Panzer divisions under Sepp Dietrich. Dietrich had long been associated with Hitler himself, having become his chauffeur and bodyguard in the late 1920s. In 1933, he commanded Hitler’s household guard, the SS-Leibstandärte Adolf Hitler, and kept that post as it grew from regiment in France to brigade in Greece to division in Russia. He was not popular with the other German commanders. von Rundstedt called him “decent, but stupid.” He wasn’t much of a commander, but he had been loyal to Hitler since 1923, the troops adored him, and Hitler was convinced that he, more than any of the Reich’s other commanders, could be trusted absolutely. The Fifth Panzer Army, which stood ready to attack the center of the American lines, was under the command of Hasso Eccard von Manteuffel, a veteran of Barbarossa, the campaign in North Africa, and the long retreat on the Eastern Front, and his conduct over the course of his distinguished career had vaulted him past corps command entirely; on returning from the Eastern Front in 1944, he was placed in command of the Fifth Panzer Army, with three panzer divisions (including the Panzer Lehr Division) and two divisions of Volksgrenadiers. von Manteuffel’s stature lent him the capacity to convince Hitler to make changes to the plan: at his urging, the artillery preparation turned from a three-hour barrage into a short, sharp bombardment, designed to throw the Americans into disarray and then exploit their confusion. He also had the time of the attack moved forward to the aforementioned 5:30, a move which lengthened the naturally-lit day for the Germans by several hours. The Seventh Army, at the south end, was commanded by Erich Brandenberger, who may as well be named General Not-Featuring-In-This-Special. Walter Model commanded all three armies, while Generalfeldmarschall Karl Rudolph Gerd von Rundstedt held overall command (von Rundstedt remarked that, with Model in tactical command of the operation, Hitler had left him “the authority to change guards at my headquarters”). We concern ourselves primarily with the Fifth Panzer Army here; I want to save the exploits of the Sixth Panzer Army for next Christmas (I have the best title for it, let me tell you). Across from von Manteuffel was the 28th Infantry Division, positioned along the Skyline Drive: the highway that ran from Diekirch all the way north to St. Vith (hey, a familiar place name!). The 28th Division’s sector was some twenty-five miles long, and tactical considerations dictated that two of its infantry regiments were to occupy only about five miles each (the 112th Regiment in the north, and the 109th in the south). That left the 110th Infantry Regiment with a fifteen-mile front to defend, and on top of that, the 110th was providing the divisional reserve, a battalion behind the Clerve river, five miles in the direction of Bastogne, leaving the regiment about sixteen hundred men in total. They could expect to defend neither the Our nor the Skyline Drive in anything approaching strength; during the day, they situated themselves in squad-sized outposts along the Our, and at night, they withdrew to positions astride major roads leading up to the Skyline Drive. That about finishes setting up the board. Let’s get those pieces moving. The artillery preparation against the 110th Infantry Regiment came to a close, and units of the 26th Volksgrenadier Division and 2nd Panzer Division crossed the Our River and moved on the Skyline Drive. The 110th Infantry held positions at Heinerscheid, Marnach, Hosingen, and three smaller crossroads further south. Unfortunately, Fishbach, a village whose name I appreciate, will not feature in this AAR beyond this mention. 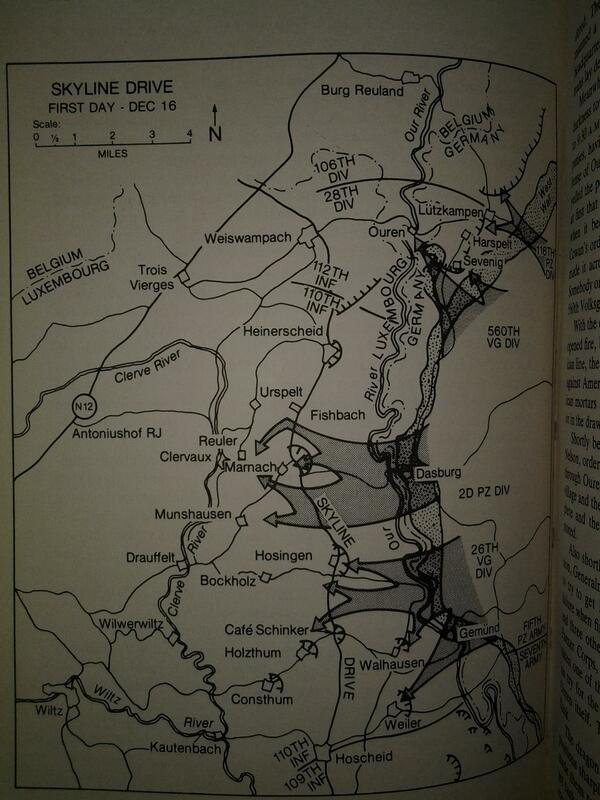 The German objectives for the 16th were Marnach and Hosingen. Roads led from Marnach to Clervaux and its bridges over the Clerve River, while both Marnach and Hosingen led via Munshausen and Bockholz, respectively, to Drauffelt and its bridge. After crossing the Clerve, they could run along good roads for the ten miles between the Clerve and Bastogne. The 26th Volksgrenadiers and the 2nd Panzer Division had orders to bypass American strongpoints wherever possible in order to focus the whole of their effort on Marnach and Hosingen. The 26th Volksgrenadiers were largely successful, reaching Hosingen while the morning fog still lingered and overrunning one of Company K’s platoons south of the town. Despite overwhelming superiority, the local commander failed to press the attack on Hosingen proper. Some of his units infiltrated past Hosingen, however, and came upon C Battery, 109th Field Artillery Battalion. They put in a desperate call to the commander of the 110th Infantry, Colonel Hurley Edward Fuller, who had just re-established communications with his division’s command post in Wiltz, halfway between Bastogne and the front line along the Wiltz River. Fuller, a curmudgeonly Texan with a temper, wasn’t the sort to let that sort of thing happen, so he called up divisional headquarters and demanded the release of his third battalion (the divisional reserve, remember). The divisional commander, Major General Norman Daniel ‘Dutch’ Cota, refused. The situation, in his opinion, was still developing, and he didn’t want to commit his reserve before he had a better picture of it. Cota did release the remainder of 707th Tank Battalion, two companies of Shermans; the battalion’s other two companies were already committed with the 112th Regiment to the north and the 109th Regiment to the south. Those two companies, still in the 707th’s assembly area along the Clerve, were only two miles away from Hosingen, and so a platoon quickly got under way to bail out the artillery. They arrived shortly, and with their help the artillerymen resolved the day’s first crisis. While the Volksgrenadiers fought around Hosingen, elements of the 2nd Panzer Division crossed the Our opposite Marnach. They happened to run into an American minefield, which delayed them until the morning fog had lifted, and by the time they reached the town, Company B and a platoon of towed anti-tank guns had gone on full alert; the German attack failed, gaining only a foothold in the south end of the village. As was to become a pattern, though, the Germans simply bypassed the little island of American territory and continued down the road toward Clervaux and Battery B of the 109th Field Artillery. The commander of 1st Battalion, Lieutenant Colonel David Paul, attempted to send a platoon from Company A in Heinerscheid south to Marnach, but they were repulsed by Germans bypassing Marnach and only made it back to Heinerscheid just in time to aid in the defense against the German attack there. Fuller, who had far too many crises on his hands to employ his two tank companies as a single unit, sent two platoons to Marnach to retake the south end of the village, while at the same time Paul dispatched his reserve, C Company, from Munshausen to carry out the same task. The two groups were supposed to meet, but C Company came under fire along the road and had to abandon it. The tanks made it to Marnach, though, and were able to clear the Germans from the town. Lt. Col. Paul sent one platoon to retrace its tracks, locate C Company, and defend Munshausen, while dispatching the other to drive south on Hosingen, which Paul thought had fallen. The first platoon did come across C Company and reach Munshausen, and the second swept the Skyline Drive between Marnach and Hosingen clear of Germans, and, to Paul’s relief, found Hosingen still in American hands. Of course, his orders left the critical road junction at Marnach in the hands of an infantry company without tank support. Shortly after 1 p.m., Major Loos’s engineers finally completed the bridge for the 2nd Panzer Division at Dasburg, whence ran the road to Marnach and Clervaux. The Mark IV and Panther tanks were nevertheless slow to cross, for a narrow, precipitous approach road on the east bank had a succession of hairpin turns that was hard for the ponderous tanks to negotiate. Only ten had crossed the span when the next tank in column took the last turn too short, crashed into one side of the bridge, and plunged into the water. Except for the driver, the crew escaped; but repairing the bridge consumed another two hours, so that it was [4 p.m.] before tanks could begin crossing again. At about the same time […] engineers of the Panzer Lehr Division completed a bridge downstream at Gemünd. At around the same time, in Clervaux, Colonel Fuller was rounding up a platoon and a half or so of men on leave in the town’s hotels and sending them east to Reuler, north from the Marnach road, where B Battery of the 109th Field Artillery and a detachment from the quad-machine gun halftracks of the divisional antiaircraft battalion were desperately fighting off a determined German assault. B Battery pulled back to Clervaux, out of immediate threat, while Colonel Fuller once again implored General Cota to release the divisional reserve. Cota refused, so Fuller devised a cunning stratagem: he asked for the two hundred-odd men from the division’s other regiments and attached battalions who had also been on leave in Clervaux. This Cota agreed to, and Fuller dispatched his new provisional company to dig in on the road down into Clervaux, while organizing cooks, clerks, military policemen, and anybody else who could be spared from headquarters duties and hold a rifle to defend the old chateau in Clervaux. Orders all the way from the corps commander, General Middleton, required that Fuller hold the town. [They] reported by radio that the Germans were attacking again supported by half-tracks firing machine guns. That was the last word to come from the men who had so stoutly defended Marnach, but a continuing noise of firing from the village gave Colonel Fuller hope that some of them were still holding out. Finally, at nine o’clock that night, General Cota released Fuller’s 2nd Battalion back to him, and Fuller immediately planned to use the new battalion to relieve Marnach. The attack would come at dawn, supported by the 707th Tank Battalion’s company of light tanks from the north. General von Lüttwitz, in command of the 47th Panzer Corps that had been tasked with capturing Marnach and Hosingen, along with a crossing over the Clerve, found himself well short of his objectives: the Americans held in Hosingen and Clervaux, and the Germans had only succeeded in taking three defended positions over the whole day: Marnach and two of the villages south of Hosingen. MacDonald writes that the success of the American defense against such overwhelming odds (two battalions against four regiments; that is, no more than two thousand men against at least ten thousand) was the most remarkable achievement by the American soldier on the first day of the offensive. I hope to update once a day from now until the end of December, giving a day-by-day account of the fight around Bastogne and, from the 22nd to the 26th, my defense and relief of Bastogne as fought in Command Ops. Far and away the most helpful source for this opening post (note the map; that’s a photograph from the book) and the daily updates to come was Charles B. MacDonald’s A Time for Trumpets, which I give my highest recommendation. Pretty much every quotation and every fact comes from that history; it covers the crucial first few days of the battle in exhaustive detail, and it’s still probably the among the most readable military histories I’ve ever read, owing in large part to the individual stories MacDonald weaves into the larger narrative. If you want a better feel for the Battle of the Bulge, this is your book. Trust me.